The Ministry of Food and Agriculture (MoFA) has entered into a 2.5 million euro Public Private Partnership (PPP) agreement to boost rice production in the country. The commercial rice project dubbed, Ghana Rice Initiative,’ which is being funded by the Government of Germany, has been launched. The project is a collaboration between the Ministry of Food and Agriculture, John Agyekum Kufuor Foundation, Intervalle, GRIB and Alliance for a Green Revolution in Africa (AGRA). It’s a €10 million project under the Partnership for Inclusive Agriculture Transformation for Africa, which is also being implemented in Burkina Faso with AGRA providing the technical support. A total of 200,000 farmers from five regions namely, Ashanti, Brong Ahafo, Volta, Central and Northern, have been targeted under the three-year project. They are to be provided with certified seeds at subsidized rates and technical and infrastructural support to boost the production of rice. 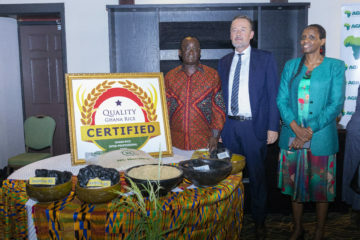 Speaking at the launch on Wednesday, November 28, 2018 in Accra, Minister of Food and Agriculture, Dr. Owusu Afriyie Akoto, commended the implementing partners and the German Government for taking the bold step to initiate such a project in Ghana, saying it falls in line with the government’s flagship ‘Planting for Food and Jobs’ programme. He said the local production and value addition of rice is critical in helping Ghana save huge amounts of money annually on the importation of rice. “The potential for rice production in the Volta Region and other parts of the country like the Central Region is enormous, he said. He stated about 600,000 metric tonnes of rice are being imported into Ghana illegally on an annual basis from Cote d’ Ivoire. He revealed that the pervasive illegal importation of rice from Cote d’Ivoire was discovered recently when he visited that country, adding that the rice was being brought into Ghana through the Western borders. The German Ambassador to Ghana, Christoph Retzlaff, said the people of Germany and their government were happy to be funding the project. President of AGRA, Dr. Agnes Kalibata, said the partnership between the private sector players would bring about visibility and transparency in the rice industry in Africa. She urged private players in the sector to collaborate to provide support to smallholder farmers on the continent.